Mix design methods for infrastructure materials used to be highly empirical and depend on representative tests and traditional modeling techniques to evaluate properties and assess behavior; however, due to scaling effects and environmental and structural differences between the laboratory and field, these methods may not accurately predict material performance. “Mechanical and Structural Nanoscale Modeling” is a Federal Highway Administration (FHWA) Exploratory Advanced Research (EAR) Program study in partnership with Virginia Polytechnic Institute and State University, aimed at improving multiscale modeling techniques. Current material evaluation is conducted using macroscale models and a set of specific failure criteria to assess behavior. As a result, some types of failure are well understood and predicted at the macroscale level, for example in cases of visible cracking where there are mechanical forces that lead to the separation of materials. Other types of failure mechanisms are more complex and require understanding of materials properties across the continuum of engineering scales, from the nano to the macro. Although nanoscale properties are recognized as important controlling factors in this cracking behavior, existing mechanical and structural models are not yet able to accurately predict phenomena at the nanoscale, or their implications for materials behavior in the field. Mixing different components can often result in complex and unpredictable physical interactions, chemical reactions, and electromagnetic reactions. These forces can lead to a weakened molecular structure and reduced bonding between materials, resulting in early deformation but with no signs of visible separation or cracking. Current multiscale modeling techniques focus on one continuum, for example bridging quantum mechanics (QM) and reaction force field (ReaxFF) theory (describing the forces within and between individual atoms) to molecular dynamics; however, to understand and predict material behavior at all scales, the continuum must be addressed through quantum, molecular, and microscale models. This research aims to eliminate the limitations of current techniques by integrating a digital specimen and digital test technique that makes use of multiscale microstructure characterization, obtained using multiscale computerized tomography (CT) imaging. The study explores the use of both chemical and mechanical energy, and the combination of mechanical and electrical engineering. The goal is to develop a generalized multiscale modeling theory and generate computational algorithms and software for implementing the theory. Initially, a generalized multiscale dynamical field theory will be developed, to be followed by an integrated thermomechanical and electromagnetic theory. Corresponding computational algorithms & computer software will also be developed to enable the numerical implementation of these theories and the applicability of the theories and algorithms will be demonstrated in structural material development, including analysis under extreme environmental conditions. The digital specimen and testing technique will be utilized as a platform to bridge different scale and structure simulations and ultimately solve mesoscale problems. Multiscale CT technology will be used to image sections of the material structure from nanometer to millimeter, and an ion beam will be used to cut specimens so that the mechanical properties of materials at nano- and microscale can be characterized. The most recent update of the ReaxFF theory will be utilized and other techniques will also be implemented, including the use of molecular dynamics and joint statistical mechanics to apply mathematical tools and theories to study and develop rules for behavior. How ReaxFF theory enhances mix design and understanding of material behavior. How multiscale modeling enhances accuracy in predicting material deformation and failure. How multiscale testing of specimens reduces the effort required versus traditional modeling techniques. How multiscale modeling techniques provides educational value. How these techniques could be integrated in the future multiscale infrastructure. 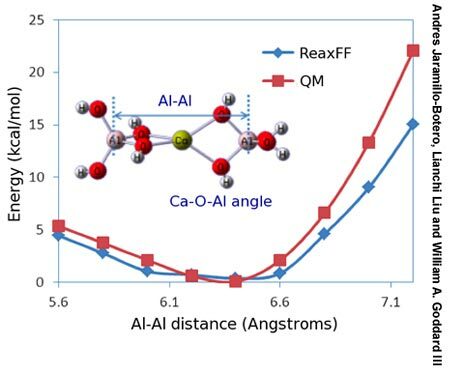 ReaxFF predicted molecular geometry for a partial Ettringite crystal is in close agreement with QM data (Al-Al distance and Ca-O-Al angle example shown here). There are some significant challenges to overcome, specifically verifying the bridging scales methods and addressing computing power limitations. The multiscale modeling techniques are ultimately expected to have significant impact on guiding material mix design for desired properties. The study is expected to minimize demand for mechanical testing, especially testing at nanoscale and under extreme conditions, and enhance the accuracy of predicting structural failures. The development of prototype computer software will also enable integration of several modules capable of performing multiscale modeling of realistic structure or materials problems. If successful, the results will minimize the demand for empirical testing in research and material development and enhance the accuracy of predicting structural failures. The findings of this study may lead to significantly reduced costs for testing and evaluation of material and the design of mixes with high-performance and multifunctional properties. Additionally, the multiscale modeling software could eventually be adopted as an exploration tool for predicting structural and material behavior under complicated environmental conditions. For more information on this EAR Program project, contact Kunik Lee, Ph.D., FHWA Office of Safety Research and Development, at 202-493-3491 (email: kunik.lee@dot.gov). FHWA’s Exploratory Advanced Research (EAR) Program focuses on long-term, high-risk research with a high payoff potential. 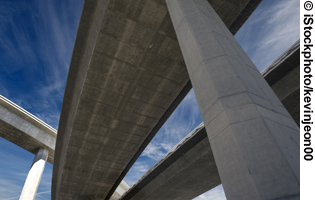 The program addresses underlying gaps faced by applied highway research programs, anticipates emerging issues with national implications, and reflects broad transportation industry goals and objectives. To learn more about the EAR Program, visit the Exploratory Advanced Research Web site at www.fhwa.dot.gov/advancedresearch. The site features information on research solicitations, updates on ongoing research, links to published materials, summaries of past EAR Program events, and details on upcoming events. For additional information, contact David Kuehn at FHWA, 202-493-3414 (email: david.kuehn@dot.gov), or Terry Halkyard at FHWA, 202-493-3467 (email: terry.halkyard@dot.gov).